Home Local News PALIT BISE SUPORTADO NG ATING MGA KABABAYAN SA IBAT-IBANG BANSA, SIGAW NILA STOP SHAMING DUTERTE. 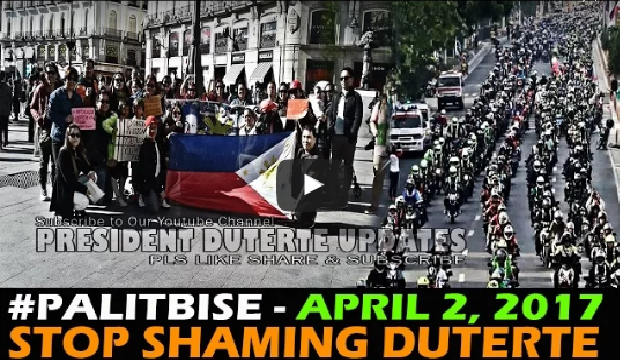 PALIT BISE SUPORTADO NG ATING MGA KABABAYAN SA IBAT-IBANG BANSA, SIGAW NILA STOP SHAMING DUTERTE. Headlining the rally, scheduled to last till midnight, is social media influencer, Philippine Star columnist and MTRCB board member Mocha Uson, and pro-Duterte lawyer Bruce Rivera. The billing for the rally is a play on the phrase “Palit Ulo” (Head Swapping) which Robredo had used in her video message to a United Nations panel on illegal drugs. She was describing an alleged practice of Philippine police in seizing family members of drug suspects as “replacements” if they fail to find the original targets in their raids or operations. PNP chief Ronald “Bato” dela Rosa has flatly denied the allegation. Besides Uson and Rivera, several other personalities are expected to speak and perform onstage at the rally, which organizers expect would draw thousands of supporters of President Duterte who believe that Robredo should be impeached for acting against national interest in speaking that way before the UN.